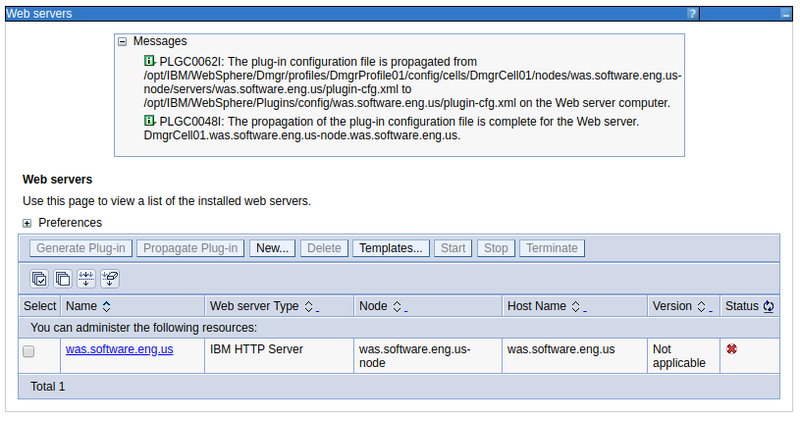 Propagating the web server plugin means that you are sending the plugin-cfg.xml file from your WebSphere application server to your IHS web server. You will typically first generate the web server plugin, and then propogate the web server plugin. Before propagating the plugin, you will need to create the directory on the IHS web server for the plugin-cfg.xml file. For example, if the plugin-cfg.xml file will be propagated to the /opt/IBM/WebSphere/Plugins/config/was.software.eng.us directory, you will need to make this directory. You will also need to ensure your IHS admin server user has write permission to the newly created directory. In the dmgr, select Servers > Server types > Web servers. Select Remote web server management. In this example, john.doe is the IHS admin server user. Ensure the user (john.doe in this example) has write permission to the directory. Setting the user as the owner of the directory with rwx (read write execute) permissions will ensure the user has permission to write to the directory. In the left panel of the dmgr, expand Servers > Server types > Web servers > your web server > Plug-in properties. If Automatically propagate the plug-in configuration file is checked, then the plugin-cfg.xml file should automatically be propagated to the web server. When "Automatically propagate the plug-in configuration file" is checked, the dmgr SystemOut.log will identify if the propagation of the plugin-cfg.xml file was successful or failed. A failed propagation of the plugin will be identified by events PLGC0063E and PLGC0049E. If "Automatically propagate the plug-in configuration file" is not checked, at Servers > Server types > Web servers, check mark the web server and select Propagate Plug-In. The plugin should now be propagated to the web server. Ensure your IHS web server httpd.conf file has the following at the very bottom of the file. You should now be able to start the web server using the web console. Likewise, you should be able to get your application directly from the application server. In this example, the application server is listening on port 9080. And you should also be able to get your application from the web server. In this example, the web server is listening on port 80.